Invite Santa to Your Christmas Event! On their journey to the North Pole, Santa & Mrs. Claus made many stops along the way. As a young couple, they were featured members of the Max Davey Singers, making many appearances at the Ford Auditorium in Detroit. Continuing their journey north, the Clauses found themselves in the wintry city of Minneapolis. There they continued their work spreading Christmas joy, incognito; originating the roles as Mr. & Mrs. Fezziwig in the musical “The Gospel According to Scrooge”. Although now living at the North Pole, the Clauses find themselves in the Detroit area on a regular basis. With Santa’s frosty hair and real beard, twinkling eyes, and with a belly that shakes like a bowl full of jelly, he spreads Christmas joy to children young and old. Santa with his rich baritone voice along with his classically trained lyric soprano, Mrs. Claus, will bring that same joy, singing and entertaining at your holiday event. A nationally televised Christmas production with Pat Boone and Sherri Lewis. Original cast recording. Opera – “The Way” performed at the Masonic Temple in Detroit. ”The Gospel According to Scrooge” featured performers and original cast recording. This televised production hosted by Dean Jones, is shown nationally at the holiday season. “The Twin Cities Passion Play” annual performances and featured vocalist – original cast recording. “The Wind is Alive” – musical production – original cast recording – featured vocalists. “JP Music – Special Edition” – musical production – original cast recording – featured vocalist. 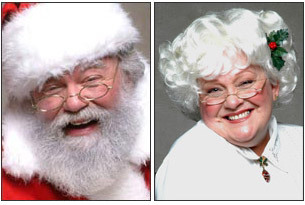 Santa appeared in nationally televised commercials for “Dudley’s Shake An Egg”, as Dudley Rabbit, Clara Clucker, and Bosley Bunny.